HP LaserJet Enterprise 600 M601, M602 & M603 printer series DOT4USB is a Dot4 hardware device. The developer of this driver was Hewlett-Packard. The hardware id of this driver is USB/VID_03F0&PID_A517&mi_00; this string has to match your hardware. 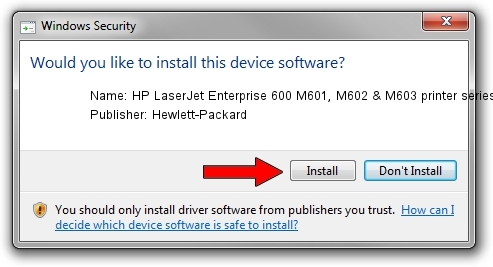 Download the driver setup file for Hewlett-Packard HP LaserJet Enterprise 600 M601, M602 & M603 printer series DOT4USB driver from the location below. This download link is for the driver version 10.1.2.3 dated 2013-03-07. Run the driver installation file from a Windows account with administrative rights. If your User Access Control Service (UAC) is started then you will have to accept of the driver and run the setup with administrative rights. Go through the driver installation wizard, which should be pretty straightforward. The driver installation wizard will scan your PC for compatible devices and will install the driver. Restart your computer and enjoy the fresh driver, as you can see it was quite smple. This driver was rated with an average of 3.1 stars by 37705 users. Take a look at the list of driver updates. Scroll the list down until you locate the Hewlett-Packard HP LaserJet Enterprise 600 M601, M602 & M603 printer series DOT4USB driver. Click on Update.